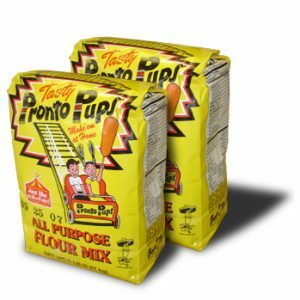 Wholesale Pronto Pups Concession Corn Dog Flour Mix | Pronto Pup Co., Inc.
One 50 lb. 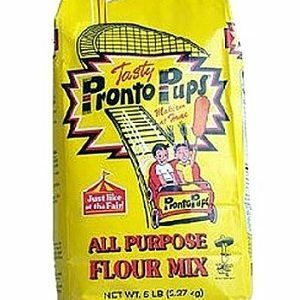 bag of Pronto Pup corn dog Flour Mix. The best mix for the best tasting Pronto Pup corn dogs!! The original Hot Dog on a Stick Flour Mix! This is the best corn dog mix you will find and you can purchase it for yourself at home or in bulk for your corn dog operation. See our wide variety of purchase options today!! One 50 lb bag of Pronto Pup Flour Mix will make approx 400 regular size Pronto Pup corn dogs. 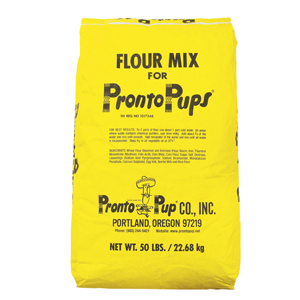 If ordering more than 1 – 50 lb bag of the Pronto Pup Flour Mix please call-in your order (503 244-9421). You will get better shipping rates!